This medium to large sized timber shed not only has traditional good looks, it also offers long lasting protection against the weather. The apex roof at its summit helps to achieve this by causing rainwater to simply bounce off or slide away, and this is further aided by the shiplap tongue and groove cladding that locks tightly together. The end result is a shed that resists rot, and that keeps your contents dry. The resistance to rot is vital in a shed of this size, so it’s good to see that this is confirmed by a 10 year manufacturer’s warranty. It shows just how effective the initial preservative dipping treatment is, although there is still an onus on the owner to repeat the preservative treatment on an annual basis. We liked the four fixed position windows that allow natural light to flood the interior. Tough and durable, you won’t have to worry about them shattering if they are hit by stones or pebbles. 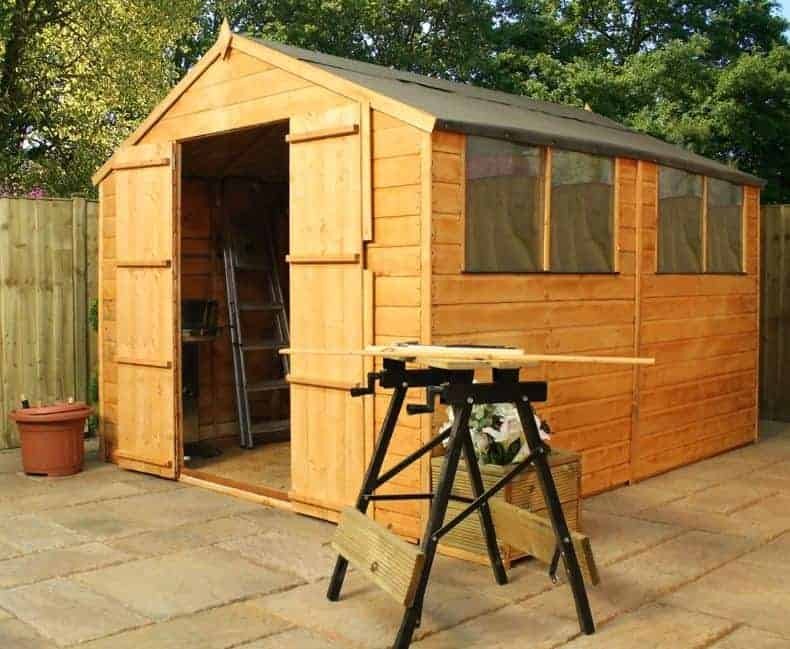 It also means that this shed can be used as a small workshop to carry out a hobby or work project, although we would have liked to see a taller eaves height as this would have added comfort for taller customers. This attractive apex shed takes a classic timber design and uses modern shiplap cladding to give it extra protection against the elements. We were impressed with the end result, and it’s certainly a building that you’ll be proud to have in your garden. With a range of fence paint colours available as optional extras too, you’ll be able to give it that personalised touch so it complements the surrounding landscape. The wide front and generous depth caught our eye straight away, but so did the relatively constricted eaves height. That’s why it’s good that the rain repelling apex roof gives the building a few more inches of vertical space. The ridge height is 2.05m, and the eaves height is just 1.65m. 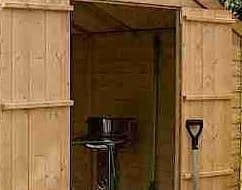 The overall depth is 3.05m and the overall width is 2.44m, so obviously you’ll need an area of at least this size on which to site the shed. We were pleased to see that tongue and groove shiplap cladding had been used for this shed, as it’s very effective at stopping water ingress. The components locked together tightly, although still allowing the slight movement that all timber needs, making it very difficult for rain to get through. We found the wall cladding to be reasonably thick and strong at 12mm, but we were disappointed that the roof was only 8mm thick. The floor is made of solid sheet material, which is a cost effective solution but again it was thinner than we would have liked it to be at only 10mm thick. If you plan on keeping anything heavy inside, or even walking up and down on the floor on a regular basis, then we would recommend reinforcing it. One area in which the shed scores highly is in its weather proofing qualities. 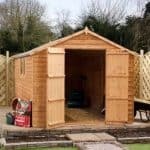 Windisor have pre-dipped the shed to give it a good level of initial protection, and combined with the cladding and apex roof this allows them to give a 10 year warranty against rot, which is more than many other timber sheds we review in this price range. 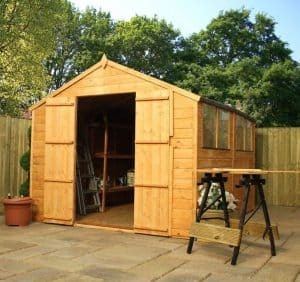 There is a requirement, however, for the shed owner to carry out an annual preservative treatment themselves, so remember to factor in the time and cost that this will take. One thing we especially liked, however, was the inclusion of a free tub of preservative basecoat with the flatpack kit itself. The hinged double doors were the feature that struck us most upon seeing this shed in its assembled form. They are wider than most other doors we see on wooden sheds with these dimensions, and measure 0.96m. This makes it easy to manoeuvre wide objects in and out, although it also has to be said that the doorway is rather low, so you do have to watch your head when going in and out. The other feature that can’t fail to catch the eye is the set of four windows. They contain styrene glazing which gives the clarity of vision associated with glass but which is considerably tougher and more shatter-resistant. One thing we really liked about them is that the panels containing the windows are interchangeable, so you can decide on which side of the shed you want them to be positioned. The large number of windows are a great boost to the illumination of the interior, but one side effect is that they allow passers by to easily see what’s kept inside. This can have security implications, so we would have liked to see a padlock included, or even a shed alarm. The doors do come with a pad bolt to keep them in a shut position, but a lock will have to be sources separately to add to it. We were glad to see that there are a range of customisation options available, including a portable DIY timber base support kit. 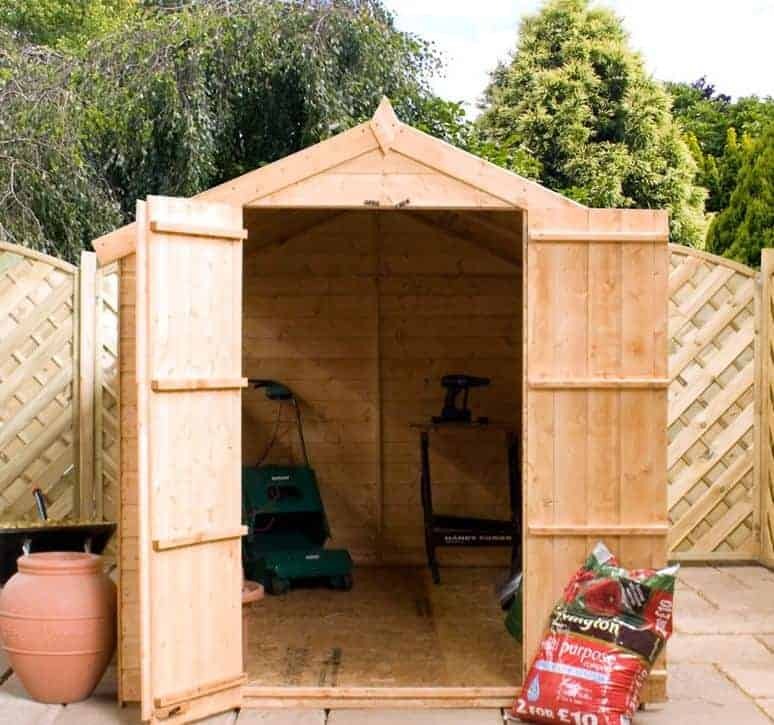 This creates a level area for the shed to be positioned on that is also raised, and this gives it added protection against rising moisture from the ground. It’s quite easy to assemble, but if you haven’t got time to do it yourself then a portabase installation service is available. 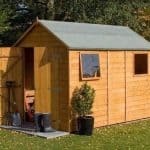 We also liked the fact that a professional installation service is available for the shed itself. This does add £319.99 to the initial cost, but it’s a great option for those who don’t have the time or opportunity to install it themselves. Another extra that can prove very useful is a selection of wood stains. Available in four colours, they mean that sunlight can’t reach the timber itself where it could quickly fade it to a silver colour. That’s why we always recommend that unpainted timber is given a colour. Whilst the quality of the components used was good, the cladding fits together very well for example, for this price we would have preferred to see tongue and groove flooring as well. We were pleased to see the initial dipped coating, and respect the 10 year warranty, but would have preferred a more substantial floor and roof. Thanks to the width and depth you can fit a lot of tools and equipment onto the floor area, but you may have more trouble with taller items. With clear instructions supplied, this can be assembled by two people within five to six hours. 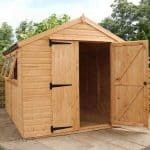 If you find the thought of assembling your own shed daunting, however, you can take advantage of the professional installation service. 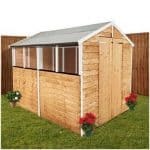 For the sheer storage area offered by this shed, we feel it represents good value for money. This could have been improved even further, however, with thicker cladding and solid sheet material. 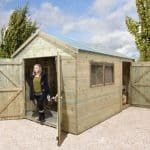 Final Thoughts: If you’re looking to increase your garden storage options, and like the look of traditional timber sheds, then this is certainly worth considering. 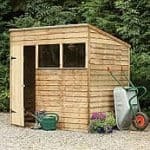 The base price is good for a 10’ X 8’ shed, although if you opt to have it constructed professionally this will significantly add to your outlay. With four windows the interior is pleasant and light, so it’s a good place to sit down, relax, and look out at your garden. You’ll need to be careful when standing up, however, as the low eaves height means that bumping your head is a danger for taller shed owners when moving around inside.